Malice in Wonderland by Nicholas Blake (Cecil Day-Lewis) was first published in 1940 but my copy is a 1947 reprint. Apparently this is titled The Summer Camp Mystery in the US. It has also been titled Malice with Murder and Murder with Malice. This is the sixth book in Blake’s Nigel Strangeways series. The setting is Wonderland – a holiday camp in England. Hitler gets a brief mention but the book was obviously written just before war was declared. The holidaymakers at Wonderland are a mixed bunch ranging from Cockneys to some rather well-heeled people, but when a prankster calling himself The Mad Hatter starts to cause trouble they’re all equally perturbed. As the pranks get progressively nastier Captain Wise the manager of the camp calls in Nigel Strangeways, a private detective. Suspicion falls on several people, and some even suspect themselves, but this one kept me guessing almost right to the end. I really enjoyed it. Until I read this book I had been under the impression that holiday camps hadn’t been in existence in the UK until after World War 2 as I had read that somewhere. This book describes the wonderful London chefs who provided the meals, a ball room, a concert hall with professional entertainers and bars. All very luxurious compared with what most people would have had at home. The camp is set on a clifftop overlooking the sea and it occurred to me that cruises have now taken over from holiday camps which sound like they were just static cruises, and as some people never even get off a cruise ship when they reach their destinations – they might as well be in a holiday camp such as Wonderland. 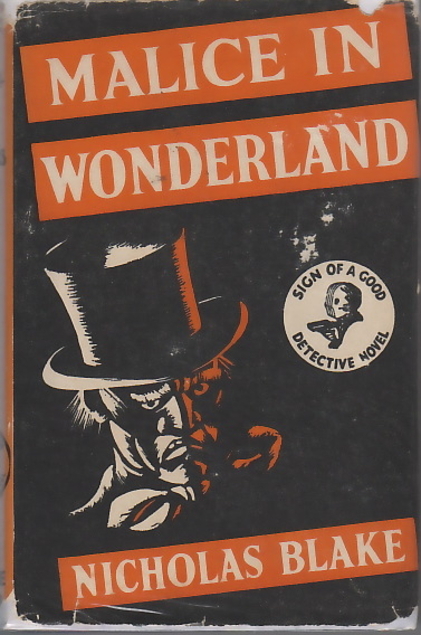 This entry was posted in Books and tagged 1940s vintage crime, Golden Age crime fiction, Malice in Wonderland, Malice with Murder, Murder with Malice, Nicholas Blake by Katrina. Bookmark the permalink. Interesting to hear about holiday camps at the start of their era. I was reading an article very recently about the huge investment Butlins have made to upgrade their camps – now to be called resorts I believe. I can’t be sure, but I think this article likened the new resorts to cruises. That is interesting. I doubt if people here will give up their foreign holidays in favour of a holiday camp, given our weather! I’ve never been at a holiday camp but I have been on a couple of cruises and they seem very similar to me. This sounds great. I read two or three of Nicholas Blake’s books about a year ago and enjoyed them, but haven’t looked for any more since then. I like the idea of a holiday camp setting and that’s a good point about them being like static cruises. It seems such a shame not to get off the ship! I think some people just go on cruises to eat the food and have an all inclusive drinks deal which means they can booze constantly!